The power utility’s problems may be even worse than we think. We now know that the dramatic and chaotic escalation of load shedding on Saturday – from Stage 2 to Stage 3 and then Stage 4 within hours – was caused by the loss of imports of 1,100 megawatts (MW) of power from Mozambique. Tropical cyclone Idai damaged the transmission lines that carry power to South Africa from Cahora Bassa. Eskom has to maintain an operating reserve of 2,000MW at all times, hence the need from Saturday to curtail load through load shedding (which is, effectively, managed blackouts). Along with the announcement on Friday came the “forecast” that Stage 2 load shedding would continue until “the middle” of this week. This is unprecedented. And the only reason that this forecast was/is “only” until Wednesday is because a de facto long weekend starts on Thursday! With imports off the table for days (if not weeks), expect the forecast to deteriorate. What Eskom hasn’t said explicitly is that it relied (heavily) on its pumped storage schemes to keep the lights on during Saturday. These schemes – Drakensberg, Ingula and Palmiet – together (nominally) produce 2,724MW. They are not intended to produce base-load power for the simple reason that they are net users of electricity! The schemes are used to supply electricity during peak periods, with water being pumped back up during off-peak periods, ie overnight. Presumably it is referring to at least both Drakensberg and the new Ingula power station, which together can generate 2,300MW. 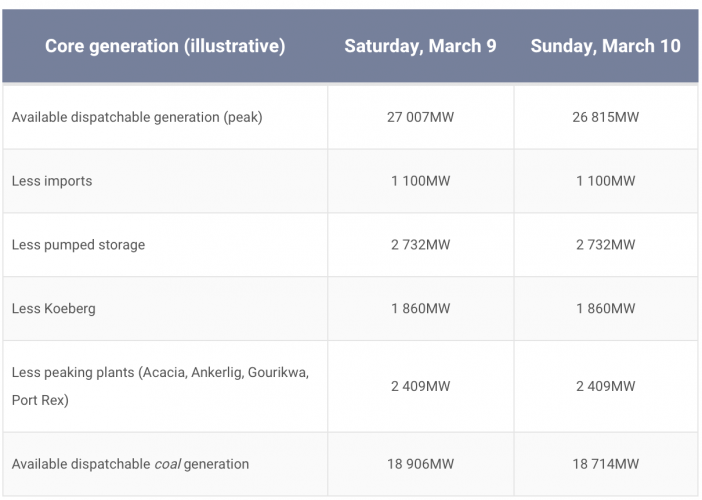 The decision to continue with load shedding through the night was another unprecedented one (it has never before continued beyond 11pm) and points to the utility once again using the pumped storage schemes for base-load power through Sunday. Eskom’s (now outdated) infographic about Stage 4 load shedding explains matter-of-factly that “should there be a need to go beyond Stage 4, Eskom and the municipalities will implement contingency schedules”. But late last year the utility published schedules for load shedding all the way to Stage 8, something it was forced to do by the National Energy Regulator of South Africa. This is a good thing, as one wonders whether these “contingency schedules” were as detailed and robust as they ought to have been. Part of the decision to use the pumped storage schemes as base-load power sources in an unexpected emergency was surely to ensure that the utility avoided – at all costs – a situation where load shedding shifted to Stage 5. It has never before removed more than 4,000MW of demand from the grid (under the old Stage 3 and new Stage 4 regimes). Because of this, a scenario where it is forced to cut demand by 5,000MW or 6,000MW inherently carries a number of risks. A lot is made of the fact that it would be politically unpalatable to shift to Stage 5, but the country is hurtling towards an election with load shedding almost certainly a regular occurrence until then. In its most recent status report, Eskom says total installed capacity is 46,292MW. From a capacity point of view, it includes the “expect import at Apollo” (ie, the ±1,100MW from Mozambique) and excludes “Avon and Dedisa”. It is a mystery why it would even contemplate including either of the latter, given that they are peaking plants operated by independent power producers (IPPs). Using that report, we can see that in the first week of the month, Eskom had somewhere between 26,314MW and 28,077MW available to fulfil peak demand. We do not know the performance of various plants (or even types of plants), but we do know that given the demand-supply mismatch, Eskom is relying heavily on its pumped storage schemes, and its gas/diesel peaking plants. 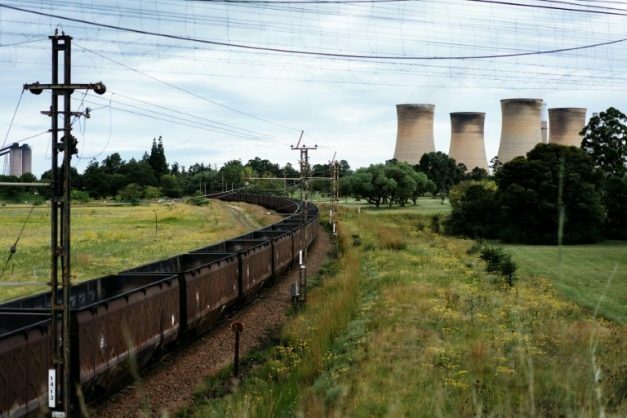 Strip this out of the equation (as well as imports and Koeberg) and it is highly probable that Eskom has less than 19,000MW available from its coal fleet. There is an additional 700MW in hydroelectric and wind power (from Eskom’s Sere Wind Farm), with use of the former at the Gariep and Vanderkloof dams “restricted to periods of peak demand”. Factor this in, and the total starts looking a lot closer to 18,000MW. Whether renewables and other IPPs are included remains unknown. But with 1,005MW accessible from Avon and Dedisa, it wouldn’t be a stretch to imagine that these very much form part of “available generation”. A well-placed source suggests that Avon (670MW) has often been running for 24 hours a day in recent weeks. Even at a generous 20,000MW, the electricity available from Eskom’s coal fleet is barely 52% of the ±38,599MW nominal capacity. At 19,000MW available from coal, it drops below 50%. The utility keeps saying that available generation capacity availability is 67% (versus an 80% target), with a reported energy availability factor (EAF) of ±62%. * The irony of this piece being written during yesterday afternoon’s four-hour marathon Stage 4 outage in northern Johannesburg is not lost on the author.